I started my musical journey at age 10 when I began piano lessons. I picked up the trombone in 7th grade and have stuck with it ever since! I've participated in a variety of ensebles such as concert, marching, and jazz band. Upon graduating high school, I planned to continue my musical career and further study the art. 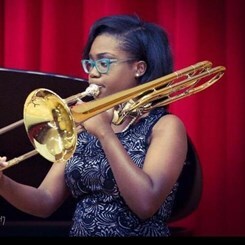 I recently graduated from Howard Universtiy where I studied music education with a minor in classical trombone performance. I'm more than happy to help you with any questions you may have!